One of the things I've learned to do is to keep dungeon mastering tastes on a short leash. This means basically keeping my 'flip book animated attention' span in check when it comes to dungeon mastering. I own a good chunk of the Dave A. Hargrave rpg books & last night I 'ohhed' & 'ahhed' over certain science fantasy aspects of the books. But its not about me at all its about the players & their PC's struggles ascending up the long level ladder. The play is the thing thanks to Gary Gygax & David Lance "Dave" Arneson. Some days it feels like I'm the only one in my little corner of Connecticut doing my OSR thing. But I'm not! More on that another time! You may not have noticed this but over the last week or so I've been on a one man quiet crusade for the Labyrinth Lord retroclone system. 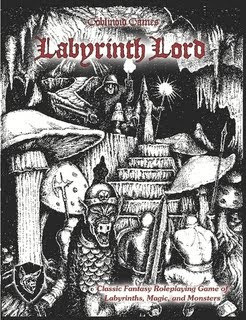 I've dialed it back down to a dull roar but Labyrinth Lord is the backbone the system for Adventurer, Conqueror, King rpg system. And I've taken it on the chin because of advancing the hobby cause of both Alexander Marcus & Rpg Pundit. But this is nothing new. This blog has gone from two thousand views to eight hundred to four hundred to two hundred. I'm not trying to reach everyone. I'm trying to reach those advancing the table top hobby of old school & OSR games. We need new blood in this hobby & taught in both the new techniques & to preserve the old ways of gaming. Do you want to make this hobby inclusive? Here's a character sheet, some dice, roll up a character, & let's get playing. Did your PC die? Roll up another one! There are large differences between the values of Labyrinth Lord & say Swords & Wizardry. Don't believe me? Check this comparison out here. Swords & Wizardry has a dedicated fan base & community, this is fine. But for me LL is the choice especially for doing science fantasy style games. 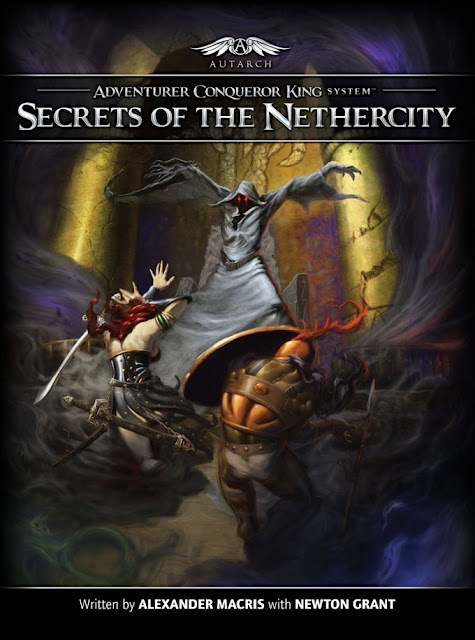 "Secrets of the Nethercity is designed for a party of experienced mid-level adventurers and is stocked with sufficient monsters and treasure to advance them by four to six levels. As such it serves as a mid-level environment in which the adventurers can acquire the wealth and power they need to advance into high-level play. " High level play is often fun but only when its achieved by slugging through PC levels. Dungeon masters have to realize that patience is a virtue for a DM & its about the play as much as the players enjoyment. This is where the meet point is for both old school & OSR game systems. 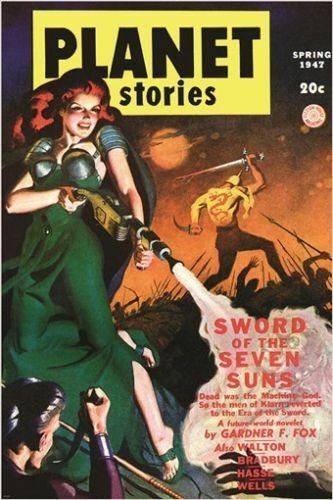 Lately for me I've been drooling over the old Planet Stories covers from the Forties & Fifties. These covers were great inspiration for my Astonishing Swordsmen & Sorcerers of Hyperborea second edition game campaign I've got coming up. 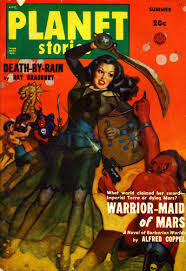 The players seem excited by the prospect but its background is drawn more from Clark Ashton Smith then it is from Edgar Rice Burroughs. Note that the heroines of Planet Stories always had some really well fleshed out backgrounds. I'm reminded of several of the charts in Arduin that I'd seen for PC backgrounds as the PC's levels go up with their experience. Historical technologies & odd artifacts were mixed in liberally not over the top within dungeons & these were often artifact level treasures with whole adventure concepts built around them. They gave kingdoms a step up and advantage in warfare & battle. The mundane were often used as both window dressing & to give a more traditional veneer to the fantasy adventure but the science fantasy bubbled under the surface of the Arduin material. Adventurers suffer for anything their taking out of the dungeon & suffer hard for any material that gets taken from a dungeon have a techno or scientist hireling to take care of treasures. Arduin seems to owe more to Lord Dunsany in its fantasy as much as to Tolkien & Robert Howard. The conceits are very Seventies Sword & Sorcery here with the science fantasy taking a back seat when needed. PC's earn everything from the dungeons in blood, sweat, tears, & PC's. Arduin is harsh on the players as an old school game adventure should be. Next time Dark Albion & The Lovecraft underworld plus much more so stay tuned!